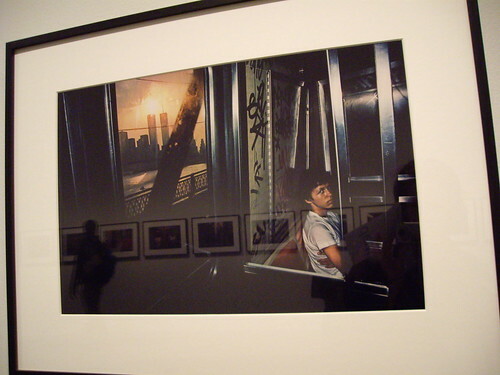 NY, Bruce Davidson at the Tate Modern, originally uploaded by still awake. I have a special fondness for photographers. They are the often unnamed historians who capture moments which can define a situation without needing a single word. Not that all photojournalists avoid writing. The Columbia Journalism Review’s column ‘Picture This’ mentions a memo written by a staff photographer and sent around on his last day at work. The online version is abridged but it’s still worth a read: http://is.gd/bFUPR. The version in the magazine brought tears to my eyes. I was killing some time at the Tate Modern on Saturday and I came across Bruce Davidson’s photographs. His images have been described as “extraordinary for the depth of their feeling and their poetic mood”. When the subject matter consists of broken windows, poor east side communities or lonesome journeys on the subway then the depth of feeling can be quite impressive. This photo in this post is a little tribute although I’m not sure I was supposed to be taking photographs. This entry was posted in Uncategorized and tagged art, Bruce Davidson, CJR, Photography, photojournalism, Tate modern. Bookmark the permalink. He’s great isn’t he? and good spotting! 🙂 I didn’t want to make it a complete rip off of his work. Thanks James. Oh very nice! I missed these the last time I was there, I will have to have look when I am down there next.